A child’s quality of life is strongly dictated by the state of their health. That’s why it’s so important to educate your children about nutrition and diet. Balanced nutrition is important to child development because children need specific nutrients to thrive and grow. Overeating, poor calorie intake, processed, sweet and fatty foods, take their toll on the body, your child’s energy, their development and their behaviour. Pesticides can too, which is why you should be teaching your children about organic. Teaching children to enjoy an organic diet packed full of fruits, vegetables, and lean proteins greatly reduces their exposure to chemicals and hormones that could be potentially dangerous to their health and wellbeing. We say “fruits, vegetables and lean proteins”, because not all organic food is considered healthy. There’s organic sugar, organic butter, organic cookies…organic lots of things! 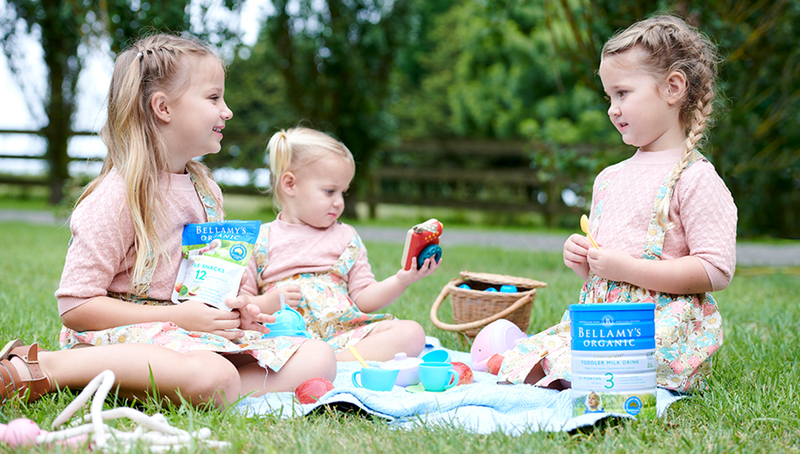 Smart organic choices make a big difference in your child’s life. The earlier they understand this, the better. Start your child on fresh, nutritious, organic food early and they’ll likely make healthy choices for life. Teach your children about “uncomplicated nutrition” – food that’s straightforward, wholesome and nutritious – and the pursuit will always be to nourish the tummy and be mindful of food selection. When discussing healthy eating and organic practices with your children, try to avoid negative remarks like making connections with food and obesity/weight gain. Talk about food only as a source of nutrition – a way to ensure better health. Explain the importance of choosing the right foods for health by detailing what it is they are eating. Make the five food groups exciting and interesting by listing the many benefits. This way your children will be naturally drawn to healthy food and will feel less inclined to choose foods with no nutritional value. Why choose something that doesn’t come with a positive narrative? Positive chatter about food gently creates a healthy relationship with nutritional value. It gives your child the understanding that they are in charge of their own health and that through smart choices they can benefit. Actions speak even louder than words, so practice what you preach. Make healthy organic choices for your own foods, so that your children can absorb information by what they see. Witnessing you choose a fresh salad over a processed cheeseburger and chips is the best way to educate them. Asking questions is a great way to learn about the food you’re eating. Ask yourself these questions, familiarise yourself, and then talk about the answers with your children. You might be surprised by what you learn about some of your favourite foods. Q1. Where does your food come from? With each generation, the disconnect between farm and fork grows wider. That’s because as our world advances technologically, we’re forgetting where our food comes from. Everything is shoppable in packaged form or from the back of a truck, so is it any wonder why? When 1,000 children were surveyed by UK farming group Linking Environment and Farming (LEAF), 5% of the respondents believed strawberries grew in the fridge, more than a quarter had no idea that carrots grow underground, and 78% didn’t know that broccoli grows on a plant. As a parent, you have a responsibility to close the gap between the food on their plates and where it comes from, so how much do you know? Q2. What does the nutritional label say about the ingredients? Food labels can be tricky to understand, but once you’ve mastered them, you can teach your kids to understand them too. Knowing what nutrition information to look for can help make healthy choices easy for all. The main thing to look for is the Nutritional Information Panel, which offers the simplest and easiest way to choose foods with less saturated fat, salt (sodium), added sugars and kilojoules, and more fibre. Q3. Where was it made? The barcodes and labels on your fresh produce can tell you a story on both where the produce has come from and how it was grown. For example, if a barcode starts with 93, you know its produce from Australia. If the PLU code starts with a 9, the produce is organic. Understanding origin not only bridges the gap between farm and fork, it helps you lower your carbon footprint by choosing local. Q4. What are the ingredients and what nutritional value does it serve? When serving up home-based recipes, do some research on the ingredients that are in the dish. Talk to your kids about the ingredients and where they come from and describe how eating it can help benefit their health. Do this casually (as if describing something you find REALLY interesting) and then let your child think about it. Next time you serve the dish, see if they can remember what’s in it. When kids learn about farming or growing food in the garden, their relationship with food changes. Knowing how they can grow food, care for it, nurture it, harvest it, where it comes from, and the benefits of preparing your own food teaches them to be responsible with what they eat. Learning about how food is produced improves their knowledge on the environment and ecosystem. Children can have fun visiting farms, where they can witness crop growing techniques and observe farm animals and livestock. Check out our list of pick-your-own farms in Australia here. If you want to bring the farm to you, grow your own. Your kids will love getting their hands dirty, and they’ll be far more eager to try foods they have grown themselves. Even fussy eaters love picking cherry tomatoes straight from the vine! Give them responsibility by offering them their own section of the garden. Let children paint their own plant pots. Choose fast-growing beginner plants such as mint, leafy greens, zucchini, cherry tomatoes and radish. Encourage regular watering, weeding, checking for pests and of course, harvesting. Make a list of recipes you can use your produce in. When you’re out shopping, consider playing games based around healthy food choices. One idea would be to challenge your child to find the healthiest thing in each aisle. Look at their choices carefully and if they are right, ask if they would like you to purchase it to try it at home. If they are wrong, talk about why it might not be so healthy and look for better alternatives. Another idea would be to play “healthy word bingo” and get kids to look for words such as superfoods, all-natural, organic, fresh, antioxidants and probiotic. Once they mark off all the words on the card, they can choose something healthy that’s not on the shopping list. When serving up food, be creative with the foods you really want your child to eat. Make a fruit rainbow to tap into their love of all things bright and colourful. Cut food into their favourite shapes. Rename a green smoothie a “Ninja Turtle” drink. Create faces with open sandwiches. Basically, make your food fun and appealing instead of just plonking it on a plate and expecting kids to get excited!